Farewell to Bro. Colin Smith, PPrGChStwd. 4th January 1944 – 17th April 2018. It was with great sadness that the Lodge learned of the Passing to the GL Above of Bro. Colin Smith, PPrGChStwd in April. Below is a eulogy to Colin from W.Bro. Peter R Champion, PPrGSuptWks. I will remember Colin as a work colleague, Brother in Freemasonry and above all as a trusted and loyal friend for over 50 years. Colin – or “Col”, “Smudger”, “The Big Man” or just plain “Smithy” – and I joined the construction company of R J Barwick & Sons Ltd within a couple of years of each other in the mid 1960s and retired on the same day – 30th June 2007 – both having completed over 40 years service. Colin started as a carpenter, quickly rose to the position of Site Manager then progressing to Contract Planner and eventually to Contracts Manager. He was justly proud of his achievements in his working life and was associated with many fine buildings throughout the Kent area. We shared many trips on site visits and meetings and unfortunately acquired a reputation for getting lost – no sat navs or mobile phones in the early days! Nothing amused him more than to see me on site on a cold, wet or snowy day – far away from my usual comfortable surroundings – and he would delight in recalling my distress in later life! Being a true country lad he had a great understanding of people and was an excellent communicator with everyone around him. Never one to suffer fools gladly but always willing to share his vast knowledge of the construction process to those eager to learn. There were many young Architects and Surveyors across the county who benefited from a quiet word of advice or one of his famous sketches to overcome the obvious gaps in their building knowledge. 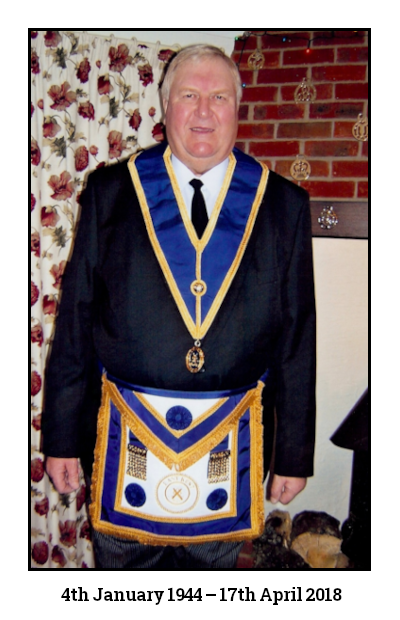 Colin was initiated in to the Corinthian Lodge No 1208 in Dover in March 1993 – proposed by W.Bro Tony Nixon and seconded by his brother-in-law, Bro John Lee. He used his communication and management skills to great effect and was the Lodge Dining Steward for over 20 years – meticulously organising the Festive Boards, Ladies Festivals and other special events. He was instrumental in organising the Lodge Fun Days at Langdon Cricket Club. Over the last few years these events raised several thousands of pounds for local charities which gave Colin great comfort and satisfaction. 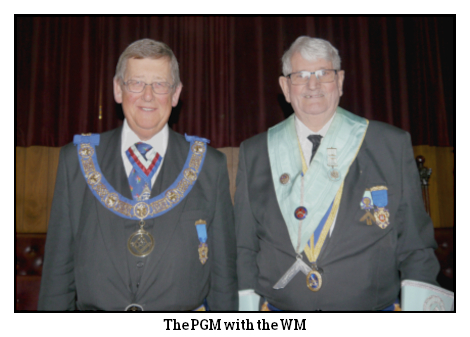 His efforts for the Lodge and Masonry in general were recognized when he was appointed PPAGDC in 2008 and promoted to PPGChStwd in 2015 - a very high rank for a Mason who is not a Past Master. He developed his wood turning skills in his retirement and generously donated many of his beautifully turned bowls, clocks and barometers as raffle prizes. His lasting memorial to Freemasonry will be wonderful gavels he produced to celebrate the 150 year anniversary of the consecration of Corinthian Lodge – 60 miniature gavels for Lodge members and the set of 3 Principal Officer's gavels. Equally memorable were the guest appearances of Father Christmas at various functions – funny that you never saw Colin and Father Christmas in the same room! Colin was a loyal and devoted family man and a strong defender of the country way of life. He fought hard to maintain the village school at East Langdon and assisted on many projects – one of the most recent the manufacture of a Mud Kitchen which was a great asset for the school. His life-long passion was cricket and he was renowned in the Kent area as a spin bowler. Many of you will have heard him relate the story of him bowling out the West Indian cricketer John Shepherd in an exhibition match – third ball for a duck! He was also a stylish batsman but he was well in to his forties before he scored 100 runs in an innings. He played cricket for East Langdon Cricket Club for over 50 years and was active in the management of the Club premises and grounds up until last summer. In his retirement, Grove End became a resting place for many “poor and distressed Masons”. The hospitality extended by both Colin and April was always in the true Masonic spirit although the renewed friendship with W.Bro. Eric Gee led to a very competitive approach to both carpentry and gardening skills. The discussion on the rightful owner of the titles "Wood Wizard 1" and "Wood Wizard 2" respectively was ongoing! Above all I will remember Colin as a great friend – together with April – and earlier with Mavis – we had many fun times. On our break in Somerset last September Colin was keen to pick accommodation which had a hot tub so that he could try it out. I was enjoying a relaxing session until Colin decided to join me when I found myself almost submerged as the water level rose dramatically! Although we seldom seemed to agree on many subjects – he could be quite stubborn as some of you may be aware! – I respected Colin as a genuine and sincere person of great integrity. Many of you, like me, will have experienced his generosity and valuable support in dealing with desperate periods in our lives. We thank him for being so important to us all – he will be with us forever. A big man with an even bigger heart! W.Bro. Peter Richard Champion, PPrGSuptWks, April 2018. On 19th March 2018 we were honoured by the presence of the Provincial Grand Master, the RW Brother Geoffrey Gordon Dearing, who joined us to celebrate our Sesquicentenary (150th Anniversary) at a unique meeting. 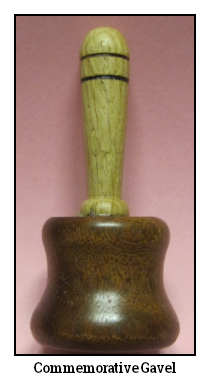 gavel crafted by the late Bro. Colin Smith. Following this W.Bro. John Grumbridge presented an entertaining description of the life and times of Worshipful Brother Henry Muggeridge, the consecrating officer of the Lodge. You may view more information about our Consecrating Officer here. VW Bro. Peter Michael Brooshooft then rose to give a brief history of the Lodge and described many of the landmarks since its Centenary meeting. At the banquet following the meeting the members of the Lodge each received commemorative miniature wooden gavels, expertly crafted by Bro. Colin Smith. 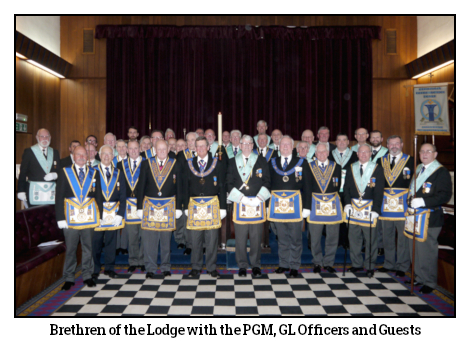 "Worshipful Master, Distinguished Brethren, Brethren all. If I may I will give you a quick précis of the Petitioners of Corinthian Lodge 1208 when it was founded in March 1868. There were ten petitioners mainly from the Lodge of Peace and Harmony No.199 Dover. The Petition was recommended by eight Members of the Royal Navy Lodge No: 429 Ramsgate. There were only nine recognised offices at the Lodges inauguration; the Worshipful Master; the two Wardens, Treasurer, Secretary, the two Deacons, the Inner Guard and a Tyler. Several Officers have been added since then and today there is a total of seventeen the last being a Membership Officer, plus the Stewards. The founding Officers will now relate a brief depiction from the Lodges inauguration, starting with W.Bro. Adamson." "I represent W.Bro. George ADAMSON the Primus Master of Corinthian Lodge No:1208, aged 57 years. I was born in Cheswick, Middlesex in 1811. I was the proprietor of the Royal Hotel, Clarence Street, in the pier district of Dover, now a customs HGV marshalling yard. I married Mary who died in 1865: we had no children. I remarried Ann before retiring to Middlesex in 1876. I was initiated into the Lodge of Peace and Harmony No:199, of which I became Worshipful Master in 1861 where I served as Lodge Treasurer and was promoted to Past Provincial Assistant Grand Director of Ceremonies. The Royal Hotel provided facilities to the Corinthian Lodge and I was elected as Preceptor 1868 -1876. I maintained an active role in both my Lodges and received promotion to Past Provincial Senior Grand Warden in 1887. I continued to maintain my membership in both Lodges until my death in Shepherds Bush, London, in July 1903, aged 92 years." "This is a depiction of W.Bro. Peter THOMPSON, the founding Senior Warden of Corinthian Lodge Aged 42 years. I was born in Westminster, London in 1826. My occupation is Draper, I have two shops one in Castle Street, Dover where I live and a second at 10, Snargate Street. I disposed of both my shops in October 1868 and moved to Windsor Terrace, Buckland, Dover. I married Ellen, in Sussex 1855, and we have two children. I was initiated into the Lodge of Peace and Harmony where I became the Worshipful Master in 1866. Although the founding Senior Warden of Corinthian Lodge I did not progress to the Master's chair but served the Lodge as Secretary 1869 – 1871. My lasting Memorial continues within Corinthian Lodge as I presented a suitably inscribed Volume of the Sacred Law ever present on the Masters pedestal." "My depiction is that of Bro. Edward William Carew LA FOREST, the founding Junior Warden of Corinthian Lodge, aged 38 years. I was born in 1830 in Middlesex, now a resident of Dover married to Elizabeth, my occupation is a Commission’s Agent and Commercial Traveller. A Master Mason of the Lodge of Peace and Harmony No. 199, a Joining Member from the Lodge of Emulation No 299, Dartford into which I was initiated in 1864. I resigned in 1872. As the Senior Warden had declined progression I was installed the Second Master of Corinthian Lodge in 1869. I was appointed to Provincial Grand Organist in 1869 and resigned from Corinthian Lodge activities and passed away 1898." "My depiction is of Bro. Henry Paul POPKISS, the Founder Treasurer of Corinthian Lodge aged 35 years. A local man born in Dover, I married Caroline and we have three sons and three daughters. My residence is in De Burgh Street, Dover and my occupation is Trinity Pilot. A Master Mason initiated into the Union Lodge No:127 Margate. I was installed as the third Worship Master of Corinthian Lodge in 1871. I served as the Lodge Treasurer 1872 – 1879 and appointed to Assistant Provincial Grand Director of Ceremonies in 1876. My life was taken when drowned at sea as result of a collision with “SS Severn” and Pilot Cutter “Edinburgh” on 14th March 1879 aged 46 years." "This is a depiction of Bro. Robert Norris MARSH, the founding Secretary of the Lodge, aged 33 years. I was born in Dover in 1835 married to Bertha and we were resident in Buckland Terrace, Dover. There is no record of children. My occupation is that of a Trinity Pilot. I was initiated into the Lodge of Peace and Harmony No. 199 Dover. I did not progress to be the Master of Corinthian Lodge and I resigned my position as Lodge Secretary after only one year. I died and was interned at Gravesend in 1874, aged years 39 years." I am a member of several Lodges, Constitutional Lodge No. 55 meeting at Freemasons Hall, London, the Lodge of Faith No: 141 at Clerkenwell. More locally I am a joining member of Royal Navy No: 429 Ramsgate, Wellington Lodge No: 784 Deal, the Lodge of Peace and Harmony No. 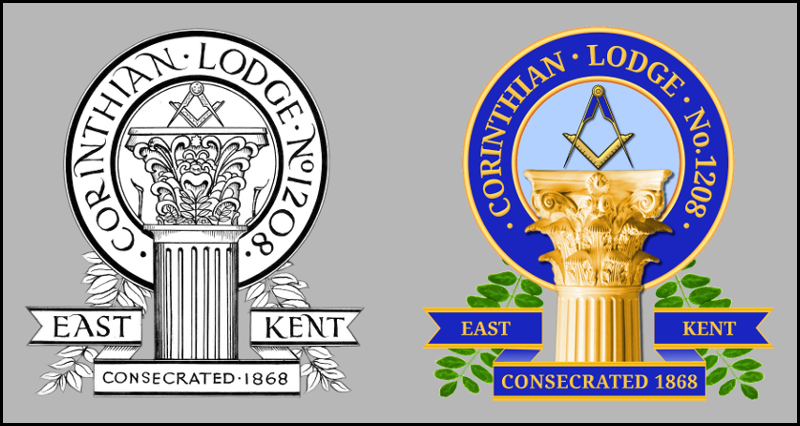 199 at Dover and I became the third Worshipful Master of Corinthian Lodge 1208 in 1870. I was promoted to Past Assistant Provincial Director of Ceremonies in 1870. I resigned in 1880." "My depiction is that of Bro. John PREBBLE, the founding Inner Guard aged 53. I am a Ship's Smith residing at Commercial Quay, Dover, opposite this building [Masonic Hall, Snargate Street]. I am married to Ann we have two children, William and Ann. I am a Master Mason of Royal Navy Lodge No. 429 Ramsgate and I was the 6th Master of Corinthian Lodge in 1873 and in the same year was appointed to Provincial Grand Pursuivant. I died two years later aged fifty-five years. Recorded in the Dover Express, November 1873. A Silver Goblet was presented to W.Bro Prebble by the Master of St Augustine Lodge No. 972 Canterbury in recognition of his kindness and charitable action in taking up the case of the orphan of their late Bro. Fennymore. He was instrumental in placing him in the Masonic School and thus rescuing him from a life of obscurity and ignorance, to that of fun, intelligence and a respectable member of society. The cup is of massive chased silver, inscribe with the words “A tribute of respect to a Father of the Fatherless”." "I represent Bro. John ROSE the founding Tyler of Corinthian Lodge. My occupation is that of Poulterer and Landlord of The Fleece Inn, Snargate Street, Dover. I was initiated into the Lodge of Peace and Harmony No: 199 Dover in 1829. I retired from my position as the Tyler of the Corinthian Lodge in 1834 and rejoined in 1836. At the meeting following our Consecration thirteen brethren became joining members mainly from Peace and Harmony and the Royal Navy Lodge. The newly designed Lodge Crest closely follows the original design, except that it is now coloured, the lettering is different and the size of the column and square and compasses has changed. We can now use the new design as a letterhead on our Summonses, Minutes and other Lodge documentation. To mark our Sesquicentenary, we have had a new Lodge banner made. The new banner will be dedicated at a special ceremony to be held in the Dover Town Hall in October. We will publish a photograph of it here after the dedication ceremony.